Well, we did it again. I think I have ridden the White Rim around Canyonlands every year since I started mountain biking. Sometimes we take multiple days and a few times we have ridden the whole thing in a day. This year we did it a bit different. The goal was to ride the whole 100 miles unsupported. Also usually we start at the turn of to Mineral Bottom road and ride clockwise. This year we started at the bottom of Shaffer's trail and did it counterclockwise. Like I said, the plan was to start at the bottom of Shaffer's trail and go counterclockwise. This would give us a big climb at the start of the ride while the legs were fresh and then at the end with a downhill when the legs are tired. Also we could stash some extra water at the turnoff to Mineral Bottom. And the last great idea of this plan was that we would be riding downhill on the long Mineral Bottom Road. Going clockwise the road is long boring and tedious, so we sometimes skip that part of the loop. So I started out with a gallon of Gatorade in my Camelbak, and two water bottles on my bike. Amazingly everything worked as planned and I ran out of water just a couple of miles before the finish. We only had a few problems. Before we had ridden half a mile from the truck I broke my chain. It was a brand new chain I had put on the day before because I broke the previous chain on the Tuesday before. So we fixed the chain but couldn't get the shifting to work quite right. As the ride continued on my shifting got worse and worse, until by the end I only had the lowest gear and a couple of the highest gears that I could use. It turns out the cassette was loose and getting worse as I rode. The only other problem we had was my biking buddy ate too much at "lunch" (at around 3 pm) and got stomach cramps. So we had to rest for awhile on a rock. The place we stopped to rest had an amazing view. I sat there for awhile and wished I had my camera. I didn't bring my camera with me because on these one day trips we typically don't have much time to get good pictures, and my pack was already too heavy with all the Gatorade. 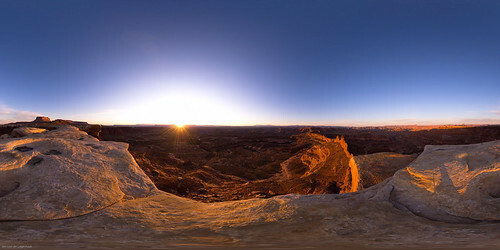 Anyway the view was off into the Maze district of Canyonlands. It was a beautiful view of white cliffs hanging over the red rock below and the red rock formations found in the area. The canyon with the Green River below was a lot like looking at the Grand Canyon. It was a great view and made the recovery stop more than worth while. © jaovandelagemaat All rights reserved.